We’re getting so close to the end of the year and my 2017 beauty favorites! These five gems were the latest to make the cut for my November 2017 beauty favorites. I’m sharing some brush tools, skin care, makeup and (GASP) a PRIMER in today’s post, so if you’re a fan of favorites, let’s get to it. If you have any loves from this month that you haven’t been able to put down, please let me know in the comments. These products have been well-loved by me for over a month and if you think they’d be helpful to you or a friend/family member, share this post with them. I’d really appreciate it! I occasionally let myself get makeovers done at Sephora and/or MAC just to get a different perspective. Recently, I went to Sephora for a makeover and the artist used this highlight brush and I immediately fell in love. As someone who typically used fan brushes for highlight before, this is just so much better at concentrating highlight exactly where you want it and works really nicely on my (slightly) textured skin. Once you try this brush, you’ll never want to go back to applying highlighter any other way. After seeing tons of rave reviews on this bronzer, I took a risk that this WASN’T going to be too light against my medium/olive skin. As you can see from this photo, the Butter Bronzer (used shade ‘Bronze’) is a beautifully natural powder that layers wonderfully. Word on the street is it’s coming in more shades soon! Such a great drugstore buy. Another win from Paula’s Choice! Vitamin C is key in helping brighten the complexion; particularly for hyperpigmentation (like spots leftover from acne scars – my weakness). This super potent 25% vitamin C spot treatment helps fades my acne scars in conjunction with my fabulous LED Lightstim tool. I use it nearly every night, focusing on specifically stubborn acne scars. Literally cannot be without this tiny tube of miracles. I talk a big game about NOT loving primers because I haven’t tried many (until recently) that have seemed to do much of anything under my foundations. ENTER perfect canvas. All I can say is WOW. I did not expect anything from this because I’m such a non believer in primers.This product does more than a primer alone. First of all, it’s silicone free (and although silicone don’t bother my skin, I don’t love the feeling). Perfect Canvas smooths the skin and seems to tighten my pores all-day-long so it works amazing under makeup. It’s also a skincare product, so it’s chock full of good-for-your-skin ingredients like probiotics, agave, and more so you can even use it on its own without makeup for a poreless finish. Added a couple new CT goodies to my stash and this blush was one of them. To be totally honest, I worried this pricier blush wouldn’t be worth all the great reviews I’ve read. I thought it wouldn’t last long on the skin. Boy, was I wrong. I have not wanted to use any other blush for more than a month straight. Ecstasy a stunning flush of peachy warm pink that lasts on my skin through the cold winter days here in NJ. I used to say my Tarte blushes were my longest lasting, but Charlotte for the win… again. 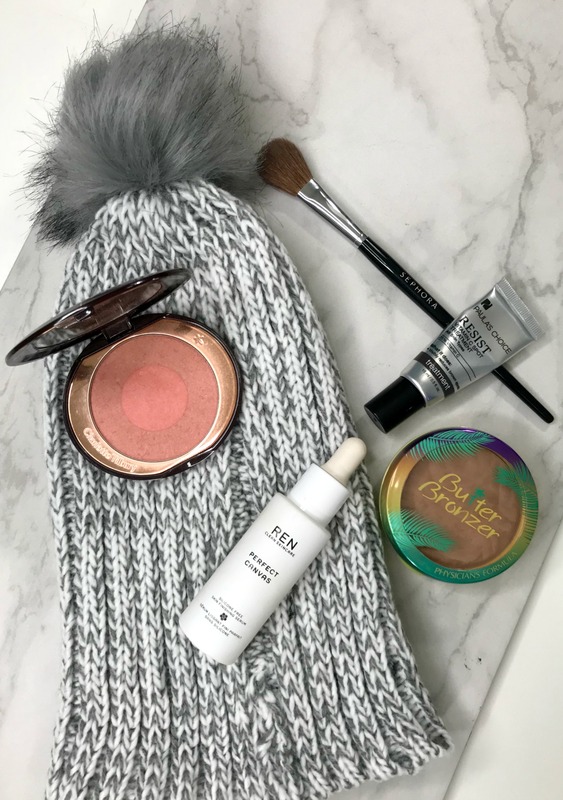 Hope you found my November 2017 beauty favorites helpful! Let me know which product sounds most enticing in the comments. "Holiday Party Glitter Makeup Look | Beauty Blogger Collab!"